This study came out late last year, but I recently discovered it. I didn’t get access to the whole article, but I have posted the abstract and a link to one of the sites that has the article below. My students thought it was really interesting, and we talked about it as an end to our photosynthesis objective. 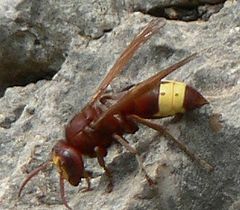 The Oriental hornet worker correlates its digging activity with solar insolation. Solar radiation passes through the epicuticle, which exhibits a grating-like structure, and continues to pass through layers of theexo-endocuticle until it is absorbed by the pigment melanin in the brown-colored cuticle or xanthopterin in the yellow-colored cuticle. The correlation between digging activity and the ability of the cuticle to absorb part of the solar radiation implies that the Oriental hornet may harvest parts of the solar radiation. In this study, we explore this intriguing possibility by analyzing the biophysical properties of the cuticle. We use rigorous coupled wave analysis simulations to show that the cuticle surfaces are structured to reduced reflectance and act as diffraction gratings to trap light and increase the amount absorbed in the cuticle. A dye-sensitized solar cell (DSSC) was constructed in order to show the ability of xanthopterin to serve as a light-harvesting molecule. Previous Previous post: I Teach Evolution! Do You?